by Peter Mirtschin. Director, Venom Science Pty Ltd. Adjunct Research Fellow, School of Pharmacy & Medical Sciences, University of South Australia. Through the warmer months of the year, it is possible to encounter some of Australia’s most venomous snakes around Lake Alexandrina, Lake Albert, Hindmarsh Island and Fleurieu Peninsula. Some of the smaller islets within the lakes and along the rivers in the region also have snakes. The dangerous snakes are common brown snakes Pseudonaja textilis, tiger snakes Notechis scutatus, red bellied black snakes Pseudechis porphyriacus and the pygmy copperhead Austrelaps labialis. Snake bites from any of these should be regarded as dangerous to humans and pets and immediate action is required to reduce the chance of death or injury. Whilst there is always the risk of snake bite in this region, it is very low and these snakes can live quite happily and in harmony with us. Nearly in all cases dangerous species of snakes will flee when approached by a humans or domestic animals. Exceptions are where they become used to us and our pets, especially if we leave them alone and they realize there is no danger. This behavior varies with the species and also with individuals but is possible with some snakes over time exposure with us. Generally the last thing they want to do is have a confrontation with us. It’s simply not in their interest. The health risks to us by having them around is minimal for humans and somewhat more for domestic pets. Removing or killing snakes is not that successful in the long term. If you have snakes around, the conditions are suitable for them and the surrounding population will soon fill up any voids we create by removing them. Killing them also presents its own risks as many of those bitten each year are from those who either try and kill a snake or have been interfering with them in some way. The best solution is to learn to live in harmony with them. They are native species and help to keep the balance right. They also keep rodent pests under control. All dangerous species at times feed on introduced mice. All of them except the pygmy copperhead will also feed on rats at times. Brown snakes are a highly successful species and have probably held their own or even increased in numbers due to the changes man has made to the environment. Introduction of the European mouse has probably suited this species and contributed to its success. They also feed on introduced rats. We need them to keep these introduced species in control. There is a range of native lizards, mammals, frogs and occasional birds they eat as well. They are prolific breeders where the females lay 12 to 30 eggs a season. Most of the babies that hatch don’t reach adulthood as their survival relies on availability of an unoccupied space, refuge, adequate food supply and avoidance of a host of predators that feed on young snakes. Generally, if you find a number of small brown snakes on your property, it doesn’t mean you will be overpopulated with snakes. Nature takes care of that. You will often read a lot of hype about snakes in the media but much of it is without foundation. It’s amazing to hear claims that there will be a lot more snakes around this year. No-one goes around dropping them from helicopters. It takes many years for a baby snake to grow to adults so no immediate seasonal conditions will make any short term difference. For snake populations to increase many factors need to be favorable. The venom from brown snakes is highly deadly. The main components in the venom are clotting factors and neurotoxins. In most human cases of brown snake envenoming, a clotting disturbance will be registered. This brought about by a powerful enzyme in the venom which activates prothrombin and ultimately depletes the blood of its ability to clot. The degree of envenomation will determine how serious this clotting defect will be. Sometimes people have incoaguable blood. This is serious as it can and has led to cerebral hemorrhage. The neurotoxins prevent our brain operating our muscles. There are 2 main types of neurotoxins and they both can cause loss of muscle control and breathing difficulties. In most human brown snake bite cases, the neurotoxins don’t have any effect however they have in some cases. With domestic pets, the story is different. Most cats and dogs seriously bitten by brown snakes present with some degree of paralysis. They can have their front or back or all legs paralyzed. Loss of control of other functions can occur but is more difficult to recognize for lay people. To treat envenomation by brown snakes brown snake antivenom is used. There is one human brown snake antivenom and 3 manufacturers of veterinary brown snake antivenom. 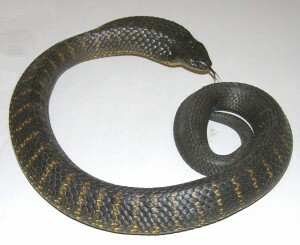 Tiger snakes used to be very common throughout the lake region and surrounding areas. Today they are far less common and their population faces an uncertain future. The critical component of their survival is water. They are essentially a water loving species. They occupy swamps, watercourses and areas with relatively higher rainfall. Frogs are the key for their survival. Studies have shown that something like 90% of their diet is frogs. Whilst the adult tiger snakes can happily survive on many types of food – frogs, mice, rats, eels, lizards and birds, the juveniles require an abundance of small frogs and tadpoles. Without the latter, no population recruitment occurs. The degradation of watercourses, the high human use of water, land salination, draining of swamps has all taken a huge toll on tiger snake populations. Where they were once the biggest cause of snake bite and snake bite related deaths, tiger snake bites now run a poor second to brown snake bites Australia wide. The fact that this has happened in less than 50 years is testament to the highly destructive nature of human occupation. Tiger snakes occur in many color forms. They can be banded as the name suggests but equally and especially in this region, they can be un-banded being black, tan, red-brown or olive dorsally. Many different banding combinations occur. They are prolific breeders and up to 80 live born young have been recorded but less than 25 is more common. Their potential to re-populate is good if some semblance of sanity is restored to human water use. Tiger snake bite is very serious. Although the venom is less toxic than brown snake venom (in mice), untreated tiger snake bites are more likely to be fatal in both humans and animals. 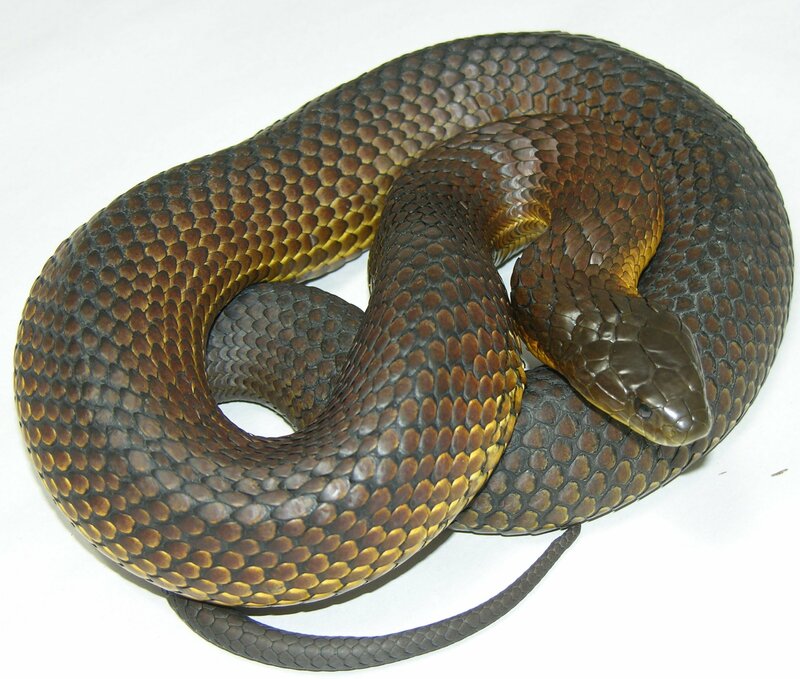 The venom contains 2 types of neurotoxins which act the same way as described for brown snakes. The effect of neurotoxins on humans is however far more pronounced and is usually present in most effective tiger snake bites. Early symptoms can be speech difficulties, drooping eyelids and swallowing difficulties. Later the more serious effects such as breathing difficulties and then total loss of the function of the diaphragm can occur. In these instances, early hospitalization is essential so breathing support can be effected artificially. Like in brown snake bites, a potent procoagulant is present in the venom. This causes a clotting defect which has similar effects as in brown snake bites. Similar risks are present in these bites as well. The third most serious effect of tiger snake bites is the presence of myotoxic components in the venom. These components cause muscle breakdown. As well as muscle breakdown, some of the muscle breakdown products can also clog the kidneys and cause renal failure. In serious cases, dialysis may be necessary. Tiger snake antivenom is used to treat tiger snake bites. There is one human tiger snake antivenom and two veterinary tiger snake antivenoms. 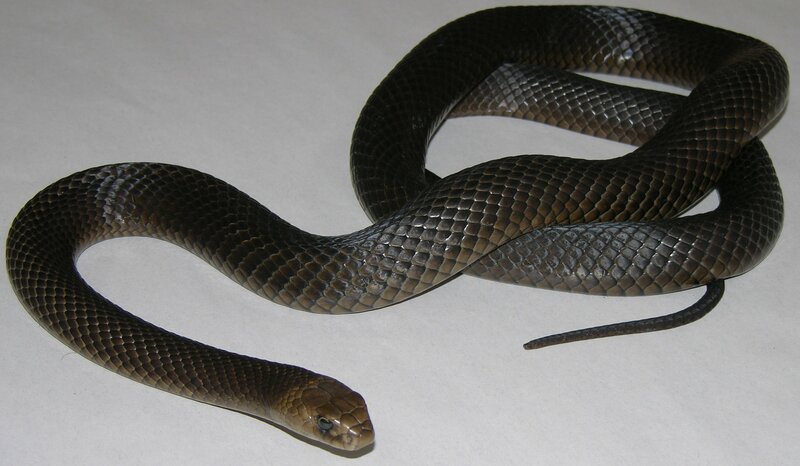 Red bellied black snakes like tiger snakes are confined to watercourses, swamps and areas of relatively high rainfall. They often occur side by side with tiger snakes in this region but also occupy areas where no tiger snakes occur. Like tiger snakes as juveniles they have a high dependence on frogs but will eat other foods such as small lizards just as readily. Their numbers have also declined like tiger snakes as result of all the water issues. Most red bellied black snakes have brilliantly shiny black dorsal coloration with crimson red flanks which diffuse into the ventral surface. 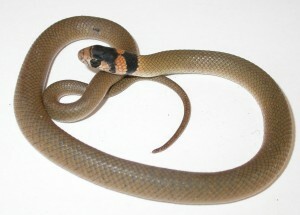 Some red bellied black snakes have grey belly’s. Red bellied black snakes will sometimes eat other snakes. They feed on frogs, mice, rats, lizards, snakes and sometimes birds as adults. Juveniles require frogs, tadpoles and small lizards. The venom of red bellied black snakes is less deadly than brown snake or tiger snake venom (in mice) and no fatalities have been recorded since antivenom has been available. The one death that was recorded before antivenom availability is questionable. Black snake bites however are an extremely unpleasant experience. Many bites do not require antivenom but the patient will probably undergo a prolonged period of discomfort and nausea. 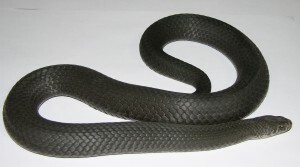 Black snake venom possesses a weak neurotoxin and weak procoagulant. Animals are often affected by the neurotoxins but humans less so. One of the features of black snake venom not present in such abundance in brown snake or tiger snake venoms is its ability to activate serum complement. This feature lowers the ability of the immune system to mount a defense against the venom which exacerbates the experience. Black snake bites are usually treated with tiger snake antivenom although the more expensive black snake antivenom can also be used. Human tiger snake and black snake antivenom is available. The status of the ability of veterinary black snake antivenoms is unclear and human antivenoms are often used to treat animals. The pygmy copperhead occurs throughout the Mount Lofty ranges and is rare on Fleurieu peninsula. None have ever been found in the Lakes area. This small species is closely related to its larger lowland cousin which occurs in the south east of South Australia and other parts of Australia. It is a light to dark grey dorsally and is not a coppery color as the name suggests. The coppery coloration is restricted to the lowland and highland forms. It is mainly a lizard feeder. Its status in the Adelaide Hills is uncertain and it may have been fully or partially dispossessed from its habitat by brown and black snakes in the lower parts of the Adelaide hills and Fleurieu Peninsula due to more favorable habitat changes caused by man. The venom from the species is poorly studied; however it is assumed it is similar in activity to that of the lowland copperhead Austrelaps superbus. It does have similar overall toxicity in mice to that of the lowland copperhead. The lowland copperhead venom has an anticoagulant activity whereby it inhibits the aggregation of platelets. The venom like that of the red bellied black snake also has a complement activator which reduces the ability of the immune system to mount a defense. No neurotoxins have been isolated from this venom but it is likely they are present. Deaths from copperhead bites are rare and even more unlikely as a result of a pygmy copperhead bite. Call an ambulance or be taken to the nearest hospital. If possible get someone to advise the hospital of your imminent arrival. This entry was posted in Seminars, Turtles & other Fauna. Bookmark the permalink.